We are pleased to assist you with function space. Previous guests have included the Electoral Commission, the Credit Unions' Christmas Pageant (for the children's change and collection point,) and a variety of musicians. We also provide a regular venue for the Uniting Church State Mission Fellowship. The people to contact re bookings are Mrs Naomi Blanchard or Dr Deb Prior during office hours: 9.00am - 3pm, Monday-Friday Ring 08 8223 1505. McGregor Hall (downstairs) has a well apppointed kitchen attached, which can also be hired. Hamilton Lounge (upstairs) is less formal in its layout and has a small kitchenette. There is a lift for those unable to use stairs. 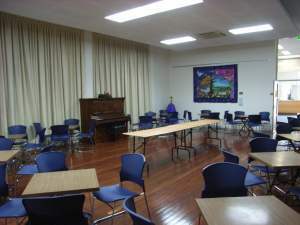 The Sanctuary (the church building) can also be hired for some functions. It is possible at a separate cost to negotiate the use of audio visual equipment and whiteboards for use during hall hire. Scots is willing to negotiate the cost of facilities hire for nonprofit and church organizations. Please contact the if you would like to use our facilities. Sanctuary: The use of the sanctuary for recitals etc needs negotiation with the Music Director, particularly with respect to use of the organ or grand piano. Costing depends on the size and nature of the event, and which facilities you wish to use. Insurance: Any group will need to provide a copy of their liability insurance policy. Uniting Church groups may already be covered under the Synod policies, but this must be verified.